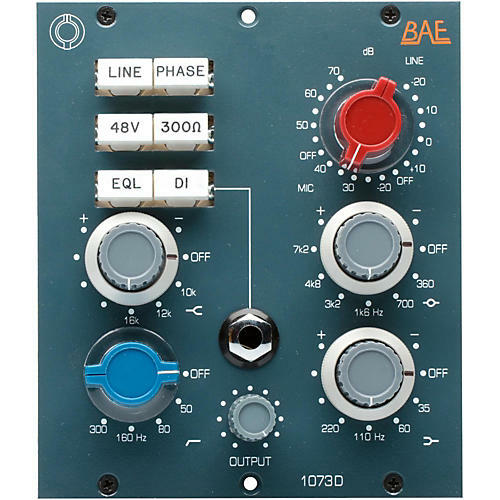 BAE Audio is known for manufacturing high-end microphone preamps and EQs that are faithful to original vintage designs from the 70s and earlier. BAE prides itself on using high-end transformers for their products, and everything is kept as close to the vintage philosophy as possible. Not only does BAE choose the highest quality components, they also insist that everything is hand-wired/soldered using discreet electronics and not economized on a circuit board. The 1073D (Deluxe) is essentially a 1073 module with extra high frequencies and a direct input for the 500 series market. Built using the same exact parts as the 10 series module, the 1073D features Carnhill transformers, Elma gold plated switches and Canford wire making this the best sounding Class A micpre EQ module on the block.